Energy for the world from Uranium! Uranium is of great interest because of its application to nuclear power and nuclear weapons. Today, however, the metal has taken on a different role -- in the form of energy. Let's read on to know more details of it. Uranium (U) is a metallic, silver-gray element that is a member of the actinides series. It is the principle fuel for nuclear reactors, but it also used in the manufacture of nuclear weapons. 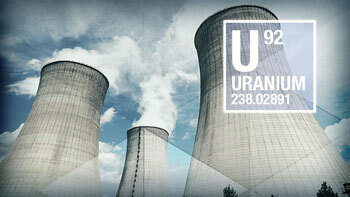 Uranium is a very heavy metal which can be used as an abundant source of concentrated energy. Today, uranium is mostly used for its unique nuclear properties. When in sufficient concentration, uranium’s many fissile isotopes can cause a nuclear chain reaction that generates heat in nuclear power reactors and produces the fissile material for nuclear weapons. One pound of completely fissioned uranium has the fuel value of over 1,500 tons of coal. 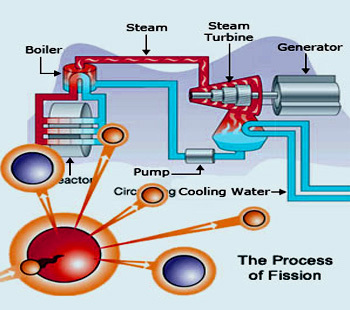 The nuclear conversion for the fissile materials can also be made in breeder reactors, which can make more fissile material than the chain reaction. The atomic bomb dropped on Hiroshima, Japan, in 1945 had a uranium core. About half a million years ago, human beings learned to make fire. By collecting and burning wood they were able to warm themselves, cook food and manufacture primitive implements. All these activities utilize various forms of energy - biological, chemical, solar, nuclear and hydraulic. Energy, 'the ability to do work' utilizing the forces of nature or the composition of dead organic material, is essential for meeting basic human needs, extending life expectancy, and providing an acceptable living standard. Energy can be of several forms: thermal, chemical, electrical, radiant, nuclear, etc. In general terms these forms can be grouped as potential and kinetic energies. No one can create or destroy energy. As per the law of conservation we can only convert the energy from one form to another using devices just like the battery to convert chemical energy in to electricity. Earth receives most of its energy from the Sun. Sun has lot of energy generated due to the nuclear fusion that happens at its core. The nuclear power (including nuclear fission and decay) is the utilization of nuclear resources for the generation of electricity. Majority of the nuclear energy is from the elements of actinide series of the periodic table which produce nuclear fission predominantly. 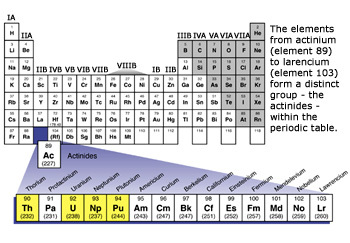 When it comes to actinides, the Thorium and Uranium are the ones that occur naturally in relatively good amounts when compared to the rest of actinides. We have small amounts of naturally occurring plutonium. The radioactive decay of uranium in general produces feasible amounts of actinium and protactinium. The atoms of other actinides are occasionally produced from transmutation reactions while refining uranium ores. The fuel used to power nuclear reactors is very compact in comparison with the traditional fossil fuels. This serves as a major source to be used in nuclear powered submarines, aircrafts, etc. 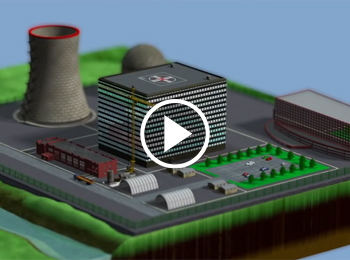 How a nuclear reactor generates electricity? A nuclear reactor produces and controls the release of energy from splitting the atoms of uranium. Uranium-fueled nuclear power is a clean and efficient way of boiling water to make steam which drives turbine generators. Except for the reactor itself, a nuclear power station works like most coal or gas-fired power stations. Using nuclear fission to produce electricity is a much cleaner technique (with no green house gases) when compared to traditional generation of electricity through burning of coal in thermal power stations. This helps in keeping the environment clean and protect it from global warming. About 2.6 billion tons of CO2 would have been released in to the atmosphere every year if coal was used instead of nuclear fission of radioactive materials. The three important components of a nuclear reactor are: Control rods, Moderator and Fuel. The control rods helps in controlling the nuclear reaction by absorbing the number of neutrons that are produced due to the fission of the radio active element. Moderator slows down the neutrons that move quickly. The typical fuel used is a radio active substance like Uranium 235. Fission process that leads to generation of electricity Enriched uranium gives off energy through nuclear fission. A nuclear power station, big enough to power a city of a million people, consumes just 3 kg of uranium a day. So it is by far the most concentrated and cheap source of energy used by man. A tiny push caused by neutrons divide the uranium nucleus. And when a nucleus splits, it releases huge amounts of energy, in a process called &apos;nuclear fission&apos;. During this process, at least two extra neutrons are produced, which fly off and cause further fission – so that once the process has started it can continue indefinitely. The energy of fission can be released slowly, bit by bit, and used to heat water. The steam from the water is then used to drive a generator, which produces electricity. This is the principle of nuclear reactor. 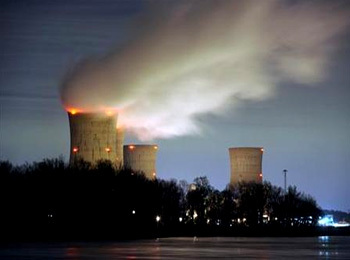 Because of the technical difficulties and safety concerns the use of nuclear power is limited. When nuclear power is released from an atom, deadly rays can escape. This nuclear radiation is very harmful. Hence the nuclear reactor at a power plant is surrounded by thick concrete walls for safety. Nuclear Power plants require less space when compared to traditional Thermal plants. Radioactive substances are available in plenty all over the world. For the next 100 years or so these nuclear materials can be used for the production of the electricity. The efficiency of nuclear power plants is far greater than the conventional thermal power plants. Nuclear power is reliable. It does not depend on the weather. We can control the output of the nuclear reactor eventhough the time factor for altering the power output is not same as for the fossil fuel stations. It produces a small amount of waste when compared to the traditional thermal power plant. 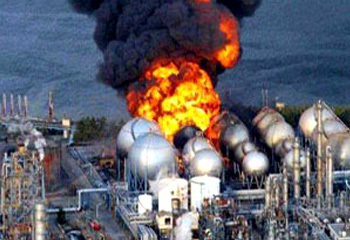 Fukushima power plant explosion due to tsunami in March 2011 Fukushima Daiichi nuclear power plant has had a nuclear disaster after the events of March 11 in Japan. The disposal of nuclear waste (the spent nuclear fuel from a reactor) from the nuclear power plant is very expensive. The radioactive waste is stored in steel–lined concrete pools. Decommissioning of nuclear power stations is expensive and time taking. When a nuclear power plant has to shut down permanently, it must be decommissioned safely reducing the residual radioactivity to permissible levels. When nuclear accidents occur, the radiation can spread to a vast area. This radiation can harm the cells of the body and may even result in the death of the person. A dangerous aspect is that the effect due to the nuclear radiation can surface years after the actual exposition to the radiation. This may even cause genetic disorders in the newly born children. If the fusion reaction inside the nuclear reactor goes out of control, there would be a nuclear explosion which releases large amounts of radioactive substances in to the environment. This disaster is called a meltdown. Generally, as the nuclear reactor will have more power when compared to the thermal power stations. All this power has to be used in a controlled manner. This power is used to heat the water and therefore rotate the turbines from the steam produced. Hence it requires large water mass for cooling purpose, as water is the best cooling agent. Therefore the plant should be near to sea or river. 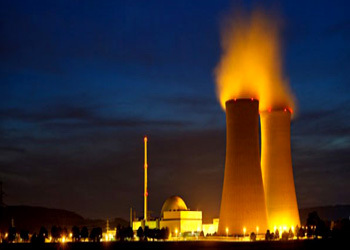 As a nuclear power plant is prone to accidents that effect the lives of the mankind, it requires large area around the plant to be isolated (almost 5 kms radius).